The mosquitoes have been devouring my legs and arms whenever I'm on the backyard working on the garden. But, I am overjoyed because my tomatoes, bitter gourd, snow peas, peppers, moringa, and molokhias are healthy and fruitful. 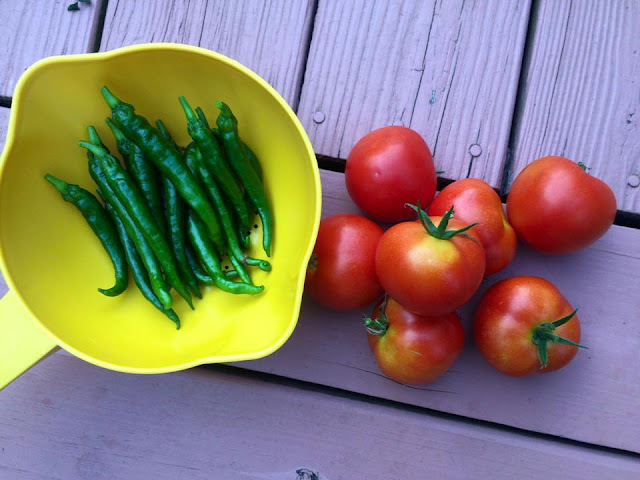 The great thing about a bountiful harvest is that we get to share them with our neighbors. 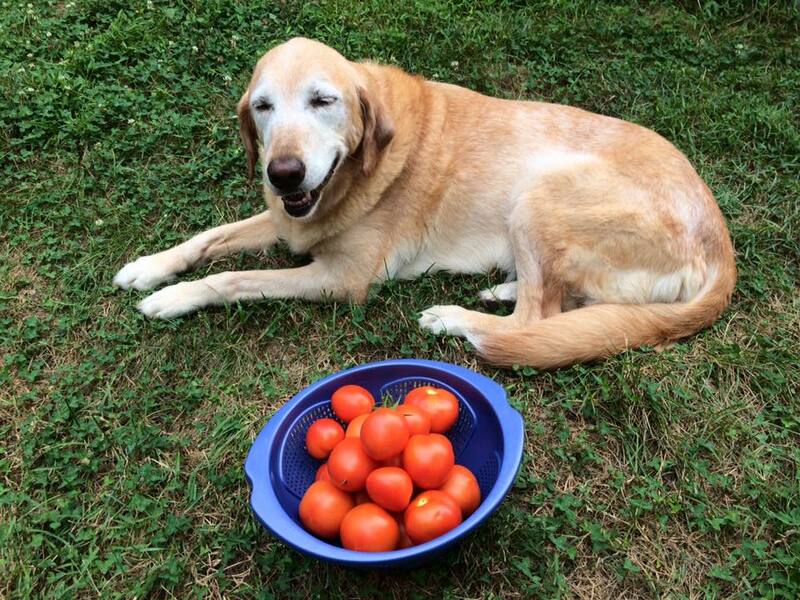 Daisy looks so happy as she watches me fill the basket with tomatoes. Fushimi Peppers and more tomatoes. August ushered in quietly. There isn't much news on my side of the woods. However in the weeks to come (not scheduled yet), I am excited to feature an author, Aidan Mc Nally, who wrote a book, Two Sons Too Many. Please do come by and read my interview and get to know the author himself and his new book. I hope everyone's having a great weekend. PS - I'm reading the new Harry Potter book at the moment. I do have flower plants as well. As for veggies, I usually plant the vegetables I miss from back home. It sounds like you grow a number of exotic items. I have never heard of some of them. Yes, I've planted some vegetables that are tropical in pots. The main reason is that, I miss my tropical vegetables a lot...lol. Hi Kayni. The tomatoes look juicy! I tried planting some pechay early this year using a plastic seedbed but unfortunately, they did not survive. Maybe it's because of the heat. I'll try again this rainy season. Hi Mylene, Thank you for visiting. It's been hot our here too, so I have to diligently water the plants. I'm sorry to hear that your plants didn't survive. Yes, try it again this rainy season. Wow, dami mong harvest, moringa is good for you!